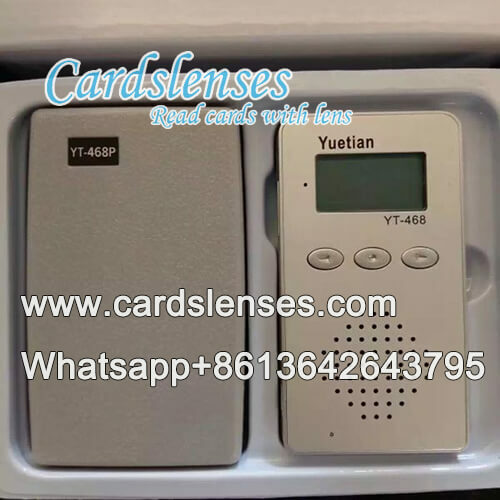 YT 468 poker hand analyzer walkie-talkie is a poker cards tricks device, working with IR ink marked cards earpiece to receiving analyzing results. The transmission distance of this YT 468 marked cards walkie-talkie is 50 meters. As long as the signal receiver is within 50 meters from the playing cards walkie-talkie, the transmission voice is clear and stable. Furthermore, you can choose different channel to connect the spy earpiece. Both of the marked deck walkie-talkie and transmission receiver can be used 10 hours at one time, under the circumstance of fully charged.